sound quality and unique designs – each Elipson design is instantly recognisable and iconic. pure sound, resulting in flawless musical output. perfectly. Offering state of the art design, cutting edge technology and exceptional performance the Elipson music centre is one you will be proud to show off in your home as your music is played. amplifiers are paired up with a 192 KHz/24 bit DAC converter. There are also headphone, sub woofer and pre-amp outputs as well as a lighting sensor found on the LED display. Even at maximum volume the music quality is flawless, an unusual attribute for most music centres. Hi-Fi Choice gave the Elipson music centre four and a half stars out of five. They reported that it combined a stylish appearance with excellent performance credentials. After thoroughly reviewing the music centre they found it to be simple to understand, a consistently good performer, well thought out and well constructed. It scored a maximum five stars for value for money and was classed as being top of the field for quality and price. With such a striking music centre it will come as no surprise that Elipson have designed technologically advanced, luxurious and stylishly designed speakers to accompany it. 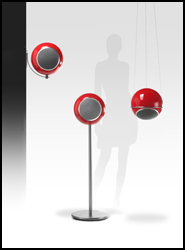 The name of the speakers is based on their spherical design, hence the brand name ‘Elipson’. They are not just designed to make an impressive style statement though, they also make for excellent listening. Coupled with the Music Centre this makes for an aesthetically pleasing and exceptionally high quality music set up. These latest speakers are versatile enough to fit perfectly into spaces of any size or shape, including great dining halls, living rooms or perhaps even your own private music room. There is no need for cables to connect your Elipson music centre to your Apple devices as the music centre offers a wireless module that attaches to the iPhone, iPad or iPod. Furthermore, the Elipson music centre comes with a USB dongle as standard, allowing for audio streaming and volume control from any of the Apple devices.